The fruitful collaboration with Halldor Ulfarsson on the feedback cellos, that started as part of the Arts Council funded workshop programme at the Live Interfaces conference, is continuing with Alice Eldridge and Chris Kiefer going to Reykjavik to work at theIcelandic Academy of the Arts. 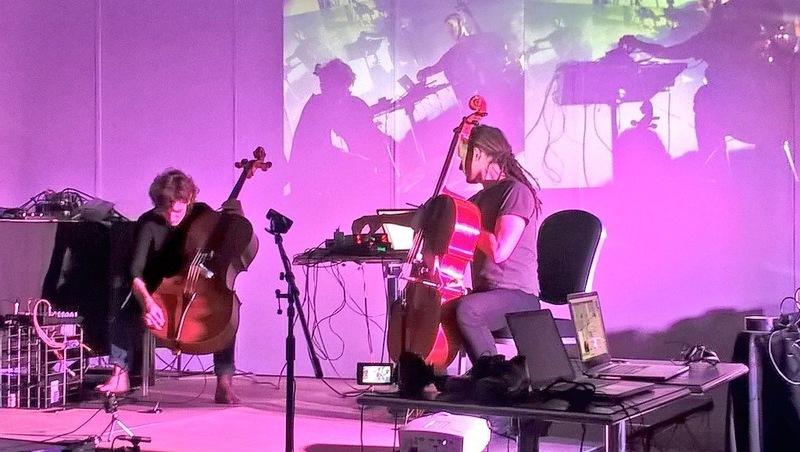 Feedback Cell is the duo formed by cellist Alice Eldridge (Collectress, En Bas Quartet) and computer-musician Chris Kiefer (Luuma) to explore their ever-evolving feedback cello project. Two butchered cellos, electromagnetic pickups, code, bows and lots of soldering. Emits dulcet drones and brutal yelps. Alice Eldridge is a cellist and researcher. Her backgrounds in music, psychology, evolutionary and adaptive systems and computer science inspires and informs systemic sound-based research across ecology, technology and music. Current projects include ecoacoustics for biodiversity assessment, networked notation for ensemble music-making and hybrid instrument building for improvisation. As a cellist she has shared stages, studios and other acoustic spaces with some of the UK’s most inventive musicians at the intersections of contemporary classical, folk, free jazz, minimal pop and algorithmic musics. Chris Kiefer is a computer-musician and musical instrument designer, specialising in musician-computer interaction, physical computing, and machine learning. He performs with custom-made instruments including malleable foam interfaces, touch screen software, interactive sculptures and a modified self-resonating cello. Chris’ research often focuses on participatory design and development of interactive music systems in everyday settings, including digital instruments for children with disabilities, and development of the NETEM networked score system for musical ensembles.